The FAQ or the question and answer format is one of the most popular formats on the Internet today to present information as well as to seek information. Services like Yahoo Answers and Quora have become very popular using the same model, letting people interact with others and contribute to the pool of world knowledge through an exchange of facts, ideas and opinions. It may be interesting to know that thousands of years ago, ancient Indians recognized the value of such a format to explore truth or teach complex ideas to the seekers of knowledge. They devised an effective and practical method to present complex ideas and philosophies in a familiar format so that people, even without prior knowledge, could understand them and relate to them. Most of the Hindu scriptures such as the Bhagavadgita, the epics Ramayana and Mahabharata, several Upanishads, Puranas, Tantras, and several Buddhist and Jain texts follow the same pattern. They present information as a dialogue of questions and answers between two people or entities, such as a teacher and his students, God and his devotee, or a learned sage or scholar and a group of strangers who come from a distant land looking for answers. The Bhagavadgita is a well-known example of this format. The book has gained popularity because of it, since anyone who reads it can put himself in the place of Arjuna and relate to it. Reading the scripture is similar to having a direct conversation with Krishna himself. Sometimes, the conversation may happen at multiple levels, as in case of the Bhagavadgita, one between the direct participants, and the other by those who may be watching them from a distance, or from the heaven. It is based on the same belief that the world is a stage, which is meant for the enjoyment of God, or Isvara. He is the silent witness to all that happens and all the conversations that take place, while he may or may not participate in it. Sacred knowledge is secret, but it will come to you according to your destiny, when you deserve it. If you respect scholars, seers and sages and listen to them with humility, you will be endowed with right knowledge and helped to progress on the path of liberation. The traditional format of healthy debates and enlightening conversations had been used in India for several centuries by scholars, kings, common people, and monks, to debate and discuss their differences or settle the esoteric aspects of Dharma. Indian religious systems are open-ended. They are not defined by intolerance and suppression of truth, but largely by the knowledge they propagate. Their merits and demerits are subject to public scrutiny, which can be analyzed and evaluated by anyone through debate and discussion. Thus, debates and discussions rather than violence and oppression were the standard means in ancient India, by which various schools of philosophies and sectarian movements gained public acceptance and approval. The tradition of scholarly inquiry and religious debates served an important purpose in promoting scholarship, exchange of ideas, plurality of cultures, faiths, and beliefs. They also helped to filter and discard unworthy ideas and irreverent philosophies, besides promoting reason and faith. The tradition of intellectual exploration continues in India even today, although on a different scale and for different reasons. 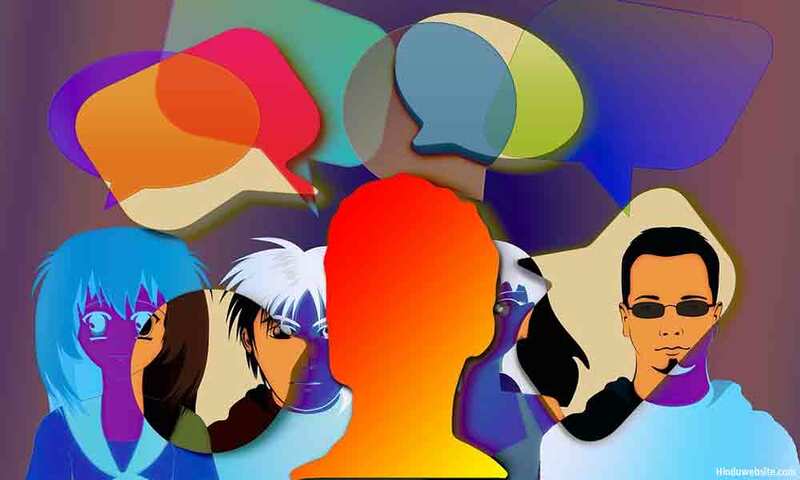 More people nowadays participate in public debates and shape public opinion, but the large number of participants often leads to confusion and conflict, rather than clarity and harmony. At this juncture, it is difficult to say how it is going to shape the society in future and what good may eventually come out of it. On the positive side, it appears that it has given a platform to the common people whose voice has been silent for long. In this regard, the following points are worth considering. 1. Public opinion is no more confined to a few elite groups. It is now shaped by a large number of people who have the access to several alternative channels of expression such as the Internet and the social networks. They bring in a lot of raw passions into the debate. Since they are not well trained in the use of reason or control of emotions, sometimes things can really get out of control. 2. The secular, intellectual groups are no more the privileged and protected members of society, who used to live in a bubble of their own, cut off from the reality of the common folk. They are now subject to a wide array of public opinions and scrutiny, which has been unnerving to many since they view it as an increasing sign of communal discard and a direct, personal attack upon them and their beliefs, rather than the growing discontent of people as how their faith is discriminated or denigrated by the out of touch intellectuals. 3. Media people and journalists do not want to participate in the debate as passive observers to record the events. They prefer to take sides, misrepresent its character, intensify the conflict, and dramatize the debate according to their narrative, political affiliation, and vested interest. They often go out of their ways to shape its outcome and its character or champion the cause of the minorities with little justification. 4. Knowledge in Hindu society is no more confined to a few privileged groups, who used to be its guardian philosophers. Today, we have a range of intellectuals from various backgrounds who are not only ready to debate and discuss the finest aspects of Hindu scholarship but also ready to pick a fight if necessary to prove their point or protect their faith. 5. The educated, intellectual, groups who shape public opinion are not homogenous. They come from diverse, social and economic backgrounds. Most of them are not secular, but deeply religious. Therefore, it is incorrect to say that all intellectuals are secular or disinterested in protecting and preserving their faith. 6. The secular elite in India have been steadily losing their influence, and their credibility because of their political affiliations, the abuse of their position and privileges, and their relentless criticism of Hindu groups, often labeling them as extremists and terrorists purely out of fear and animosity. Their place is now taken over by the social media, in which everyone can find a voice, not just the celebrities, writers, journalists, and a few politically influential people. 7. Intellectuals with vested interest or who disregard the faith of people can no more hide in the privacy of their guarded environments and get away with their snobbish, insensitive, or selective opinions. People can now find them, reach them, challenge them for a debate or threaten them with consequences. Therefore, for a sensitive person, living amidst a cacophony of voices, it will be hard to hide from the excesses of his or her past intellectual works and any negativity towards Hinduism they might have expressed or implied in the past. 8. Nowadays, the Media has to compete with the public on the social networks for attention and popularity. They are at a great disadvantage if they take a stand against public opinion and try to defend their unpopular views. It is equally difficult for them to create a favorable image if they have a history of attacking Hinduism and Hindu groups with perceptible bias. Media personalities and the secular elite in India are not mentally prepared to face fervent Hindus who speak their minds and do not hesitate to challenge their authority. They have not anticipated that the dynamics of Hindu society would allow a large number people to come together in defense of their faith. Many still believe that those voices do not enjoy widespread public support, despite evidence to the contrary. It must have become clear to most intellectuals who have shaped the public opinion in the past and accustomed to certain recognition and status in social circles that present day Hindus do not fit into the stereotypes which their leaders have created for them since independence. The Hindus of modern India, especially the current generations, have but little in common with their ancestors who suffered from bigotry and persecutions or humbly submitted to their fate in the hands of cruel rulers. The Hindus of today are much different. They do not take empty rhetoric from anyone, much less from those who tout secular politics, represent the old colonial values and ignore the sentiments of the silent majority. They are ready to stand for their opinions and fight if necessary. The secular elite and their Media sympathizers ignore this new development. They wrongly perceive a widespread conspiracy to malign them or indulge in absurd allegations and characterization. In their fear and anxiety to justify and prevent their unrealistic foreboding, which is part of their fear mongering, they filter a few stray incidents of violence and present them as characteristic of the whole community. In a country of over a billion people, you can expect at least a few cases of criminal behavior. They cannot be used to malign a whole community or present them in a negative light. Most Hindus are still orthodox and conservative, who want to live in peace and harmony, and honor their family and religious traditions. Because of the tolerance, which their faith teaches them, they do not mind who lives next door, or with whom they share their meal in a public gathering or a restaurant. They do not care what you eat, as long you do not thirst it in their face or make a mockery of their faith. When there is an earthquake or a natural calamity, they help everyone, not just Hindus. They celebrate festivals and public events with other communities, support actors and artists of different faiths, and patronize many institutions that are not Hindu. The also adapt well in countries where they are not in majority, and rarely cause violence or disturbance. Therefore, whatever is happening today is not a sign of growing intolerance, violence, or chaos in society, as the Media and the secular elite want the world to believe in connivance with other hate groups outside India, but a sign of more people joining the debate and voicing their unconventional opinions and concerns. In the past, it used to be the forte of a few elite groups who enjoyed the power and patronage of the ruling classes, and privileged access to television and print media. Now, because the public have alternatives to speak for themselves, they have to step down from their high pedestal and face direct and raw public scrutiny, which can sometimes get very nasty since people can get emotional, violent or both. What they have been witnessing since the dawn of the present century is indeed an unprecedented, growing movement of intellectual socialism on a global scale. They did not foresee it because they were not technology savvy. Growth in technology did not promote economic or distributive socialism of wealth and resources, which the secular elite have been promoting and advocating all these years. Instead, it promoted capitalism and the emergence of a new breed of hungry and mean capitalists who would use innovations in technology to build global markets and extend their influence beyond the countries of their origin. It increased income disparities and new billionaires. At the same time it brought information to the doorsteps of common people and created a level playing field for access and availability. It created a sort of knowledge based socialism, providing people with equal opportunities to share information and voice their opinion. For the elite, it has been a problem since they have lost their exclusive privileges as the voice of the public, purveyors of news, and creators of public opinion.